Oh we kid. There's some fine Dieter Rams Braun action in here, just about every important chair from the last century or so, a Wii, Kanye's favorite glasses, a Swatch...so much goodness. As an aviation junkie though, I'm somewhat embarrassed to admit I can't place that profile of a flying-wing-type glider. Anyone know what that is? Update: The guys who designed the poster, Build, are playing a similar game of "identify the iconic design" over on their blog, and they've provided a great high-res JPG of the poster to help make the game more fun. 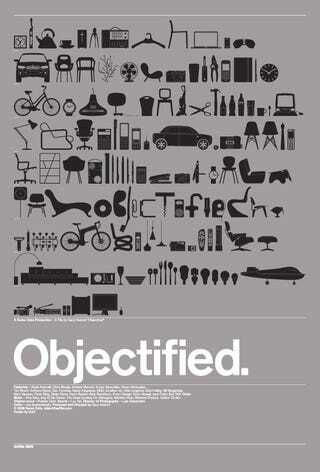 They also point out, as many of you have, that the word "Objectified" is hidden in the sixth row, and everything in the last row was used to make the film itself. Awesome.